When we moved into our new home back in June we knew we wanted to get at least one big project done. We bought the house as a complete renovation project but the bigger projects (think kitchen, bathrooms, garage conversion, probably just a dream loft conversion) will take time. However when we sold our existing property we had enough money left from our previous sale to be able to complete one big project. 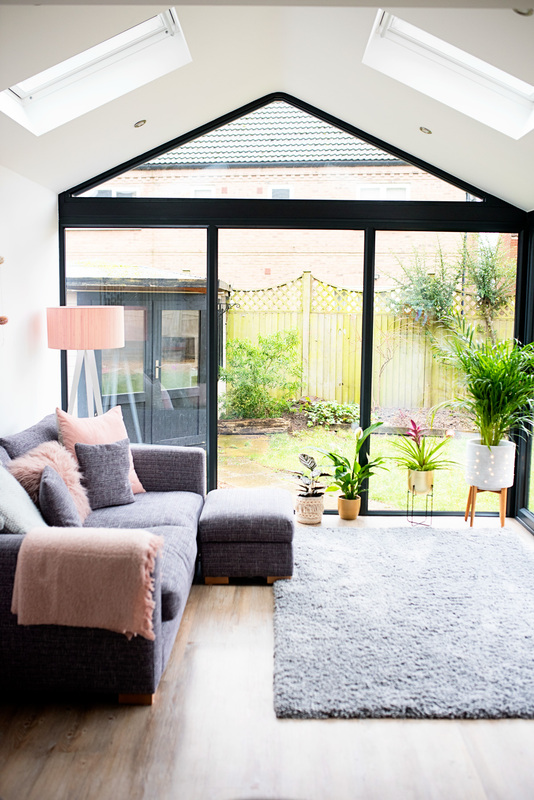 Before we moved in we were debating whether to build a garage conversion, as we have a double garage and we know that one day we want to convert one into a downstairs playroom/snug. 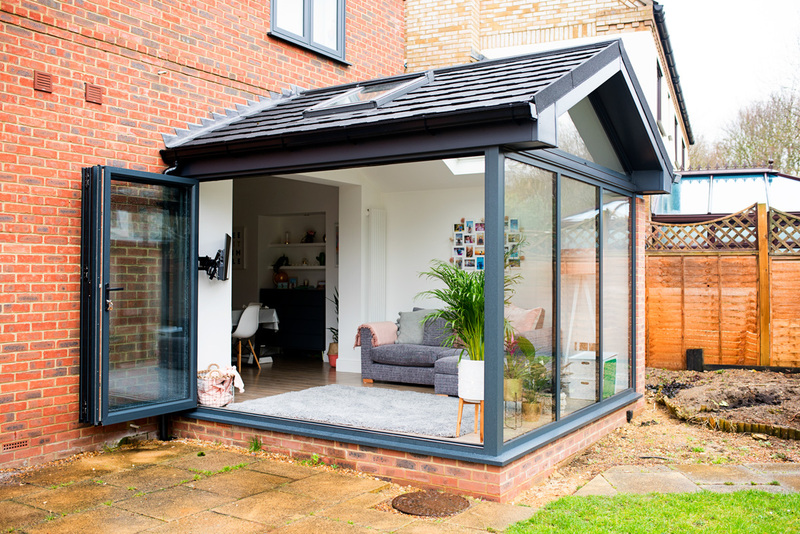 However when we moved in we instantly knew that we wanted to build an extension in place of the old existing traditional conservatory that was currently there. 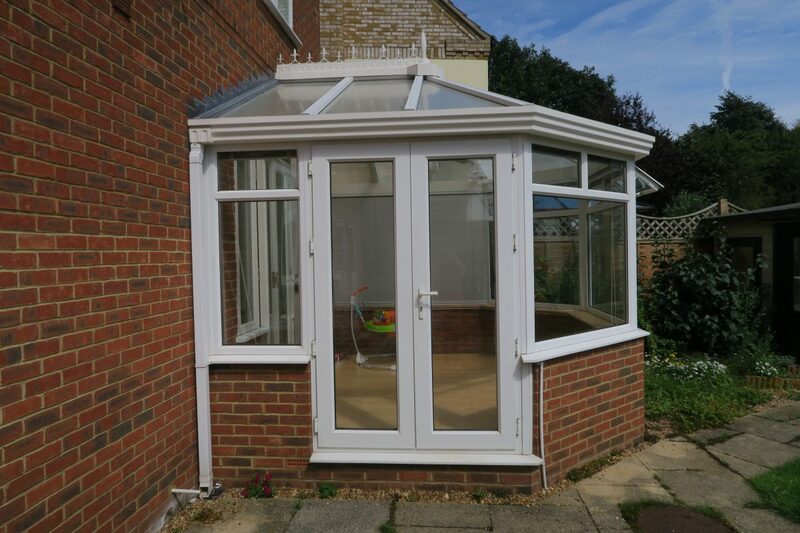 The previous conservatory was very old fashioned, one of those hexagonal shapes with lots of white PVC and a PVC roof. It got ridiculously hot in the summer and cold in the winter and was just really tired and not particularly functional for a family. Straight away we set about thinking about what would suit us more as a family. While the downstairs of our new home is way bigger than it was in our last home, we knew we wanted an extra space that would work as a family room. 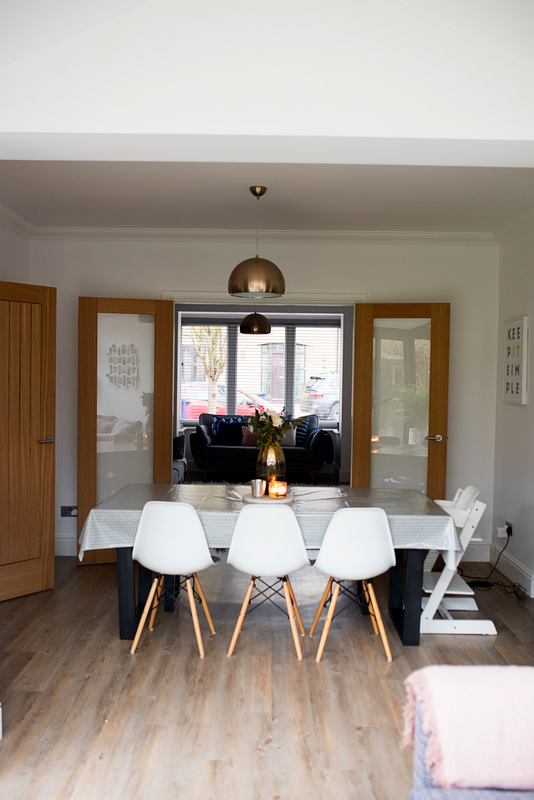 We also wanted to make the new extension feel part of the house rather than just as an add on conservatory, so we knew we wanted to knock through into the dining room to make it open plan. 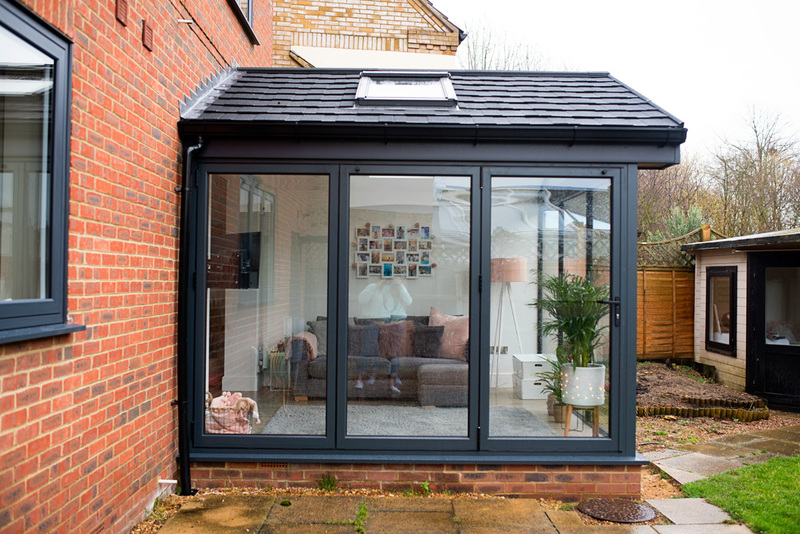 We also wanted lots of glass and we wanted VELUX windows as we had them previously in our last extension we built and they let in a lot of light and air. Bifold doors were essential for me too- we had them on our old extension and it was the one thing I missed the most about our old house. 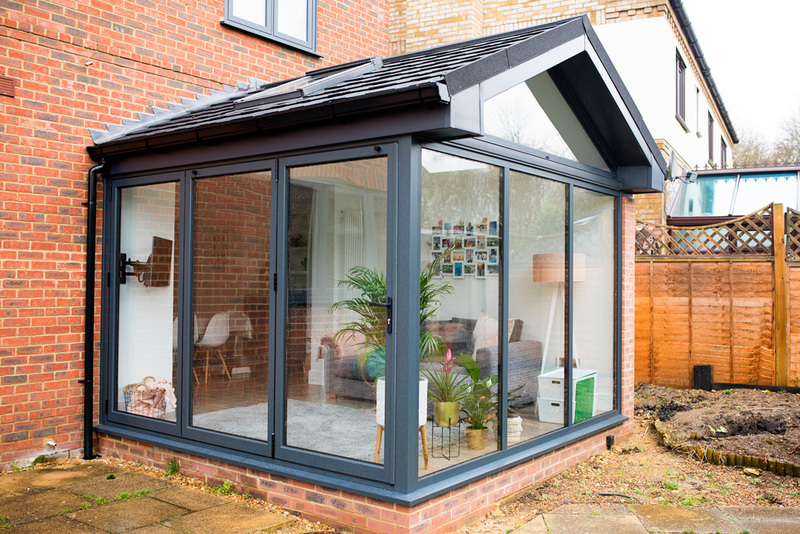 We had a couple of quotes from different companies, both builders and more traditional conservatory companies and in the end we decided to go with the company we used for our previous extension. We knew we could trust them and they had done a great job previously (if not a little bit slow and not hugely efficient at the project management side of things). The work for our extension started at the end of August and was completed by Mid November so as renovation projects go it was relatively quick and painless. A lot of it was waiting around for things like the glass to arrive but all in all it was pretty straightforward and we didn’t run into any major problems. We used the foundations from our existing conservatory but squared off the room so it was no longer a hexagonal shape. I have already done a video on You Tube showing the before and after, plus a bit of the building process, but I thought I would do a blog post too. We are over the moon with our new space and it pretty much is our dream extension (I would prefer it to overlook fields or lush greenery rather than another house, but you can’t have it all!). 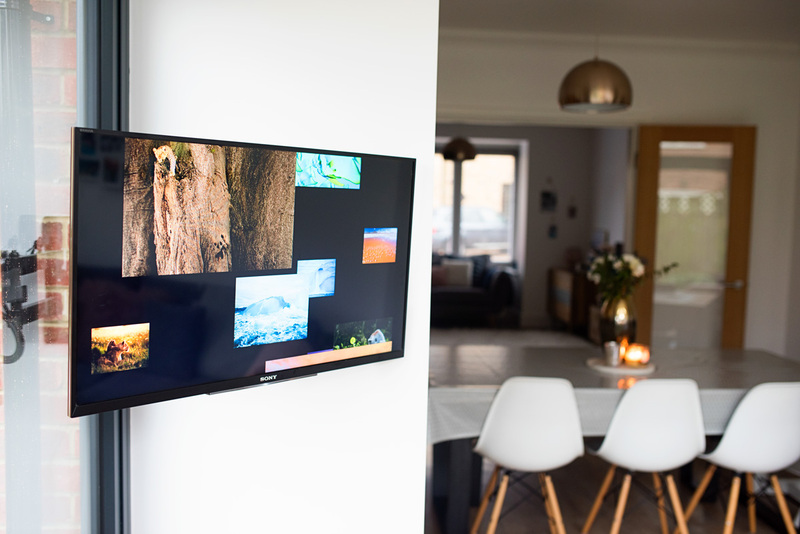 It’s completely transformed our family home and we love it so much. Already we live in the new extension 99% of the time, so much so we have jokingly called our living room (which we have also renovated along with the dining room) the ‘posh living room’ as we only tend to sit in it when we have people over or we want to watch actual TV rather than Netflix. I wanted to include a few photos of our old conservatory just so you can see what a dramatic change it has been. The second photo shows what our internal doors looked like before we made it open plan. And the third one shows what it was like inside, you can see there was a very old fashioned fan in there and quite a impractical PVC roof which meant it was boiling in the summer time and freezing in winter. This is the view of our new extension looking at it from our dining room. You can see just how much the space has changed and how it feels very much like part of the house now rather than just as an add on. Knocking down part of the wall and removing the doors and making it open plan was the best thing we could have done as it makes it all flow really nicely. We decided on Karndean flooring again as we used this in our last extension in our old house and it is really practical for with children. It’s much less echoey and cold feeling than laminate but at the same time it’s also really durable, as I would worry real wood would get scratched from a toy or something similar. In our last house we went for more of a warmer shade but this time we went for Country Oak which is a really nice light colour. Karndean is great for not making it feel too cold and still making it feel cosy. The lovely grey shaggy rug is from Next. 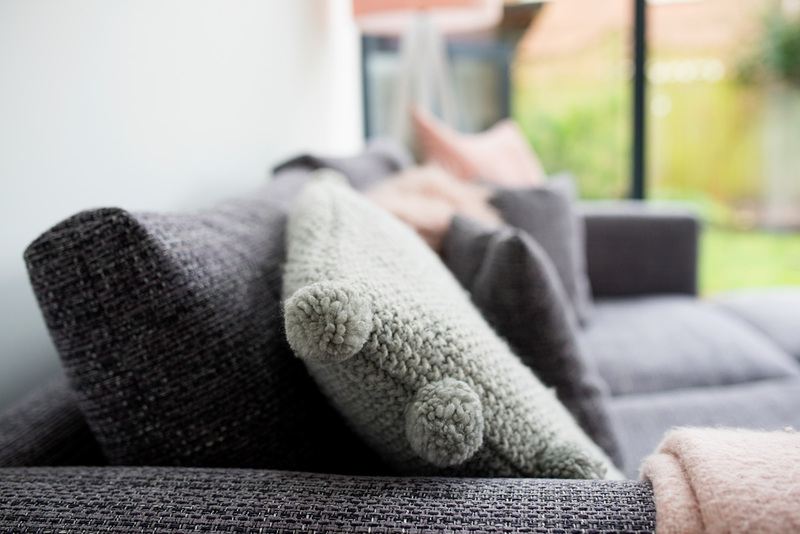 We wanted a sofa that was snuggly and cosy for our family room. We actually inherited the sofas in our last house so had never bought new ones before. 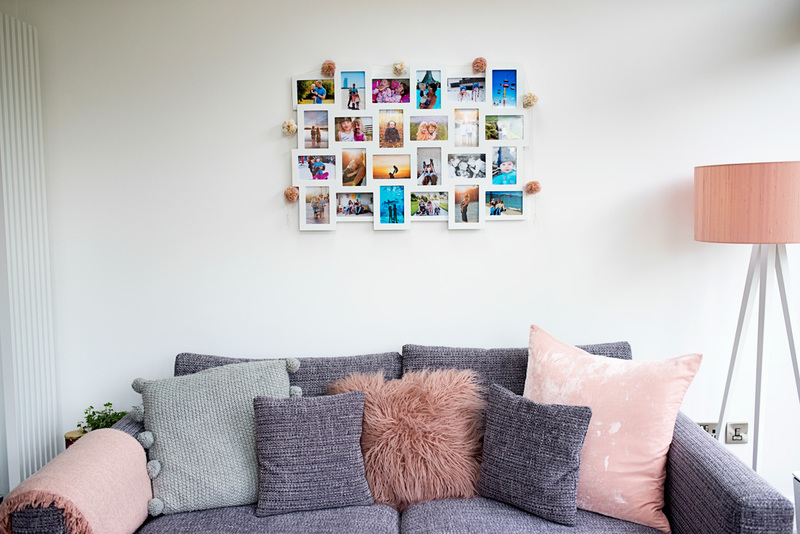 We decided on more stylish ones for our living room but for this room we decided we wanted something that was super comfy to relax together and watch films. We went and viewed some and decided on the Dillon Sofa by Sofa Workshop. I can confirm that it is incredibly comfy and also still quite stylish too I think. I decided early on that I wanted a pink and grey theme. 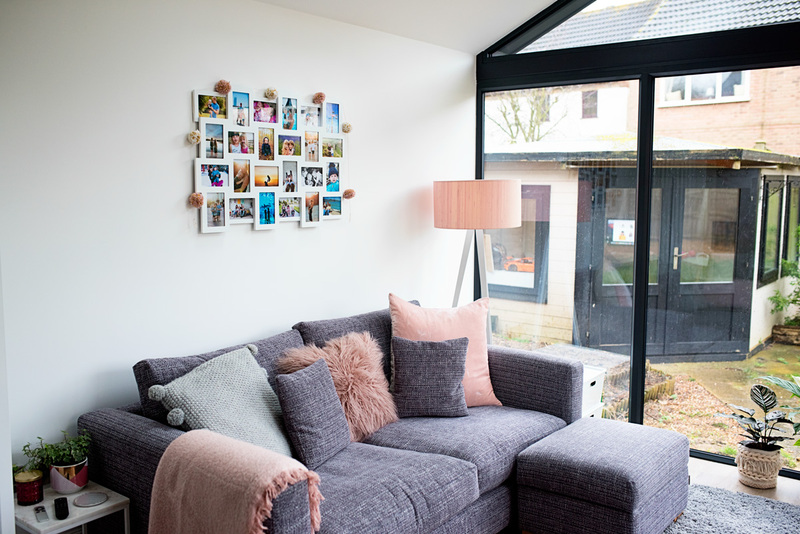 We have a pink, blue and grey theme in our newly decorated living room (post on that soon!) so as all the rooms sort of flow together I wanted to make this room grey and pink too. 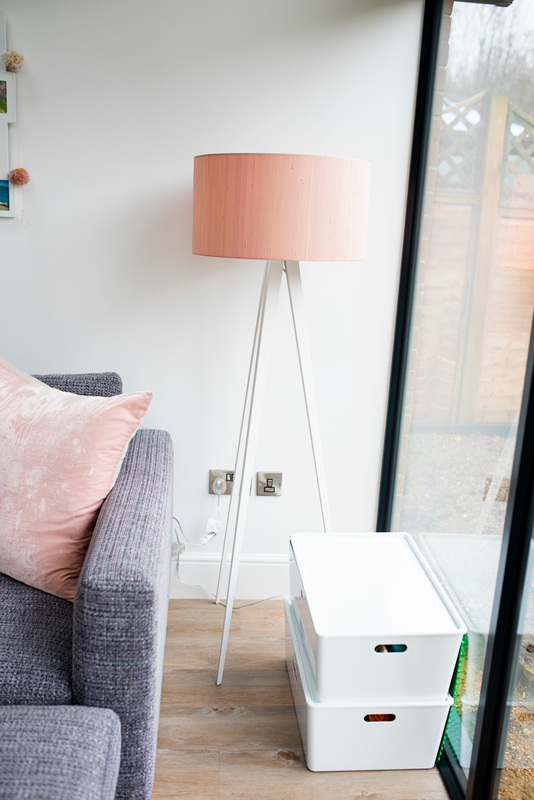 I find blush pink such a calming colour and I have elements of it in all the rooms we have decorated so far (lets hope I don’t get bored of it quickly!). 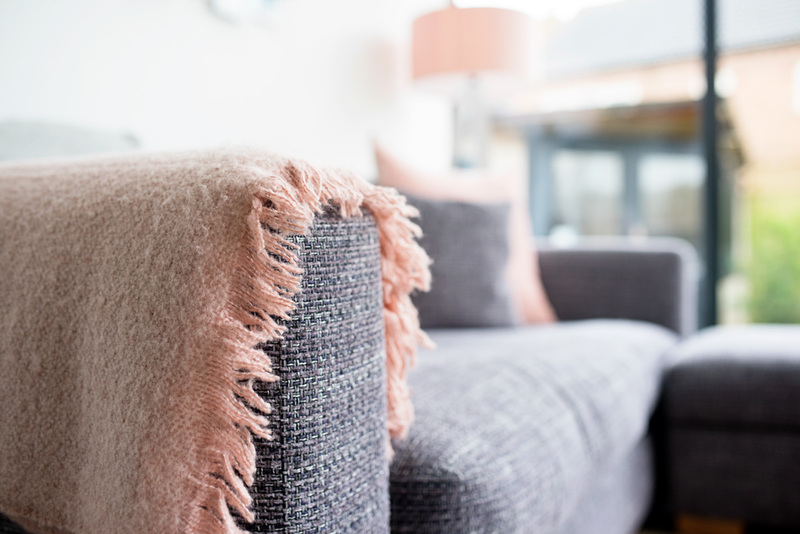 The pom pom cushion is from M&S, the fluffy pink one is from Matalan and the large pink velvet one is from Made.com. Originally I had wanted to get some prints for the space above our sofa but Jon persuaded me otherwise and I am so glad I went with his advice. He said that we had got a fair few prints downstairs already and we didn’t want to make the house seem too show home like. This is our family room and therefore he said we should have photos of our family. 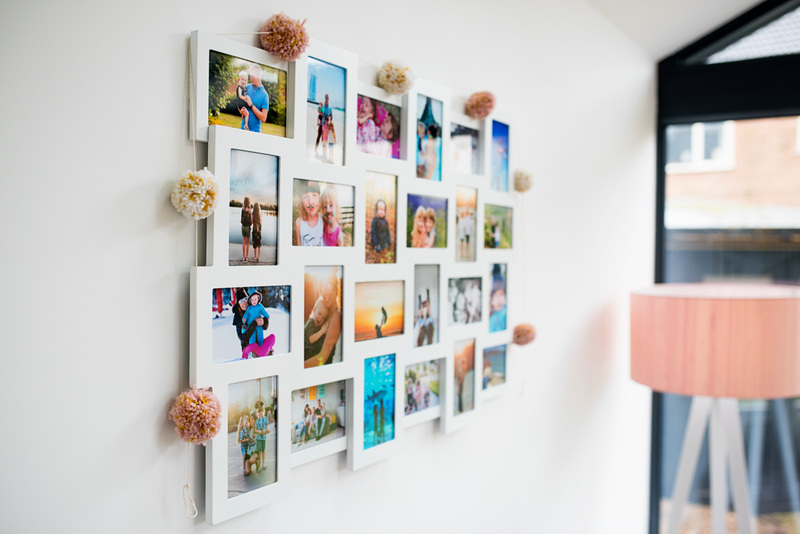 We settled on a multi aperture frame from Oliver Bonas which I adore and we filled it with the most colourful photos we could fine. It looks much better than any print could have done and it makes me smile whenever I take a second to look at it. Just to make it a bit more interesting I added a little pom pom garland from Maisons du Monde on the top of it. 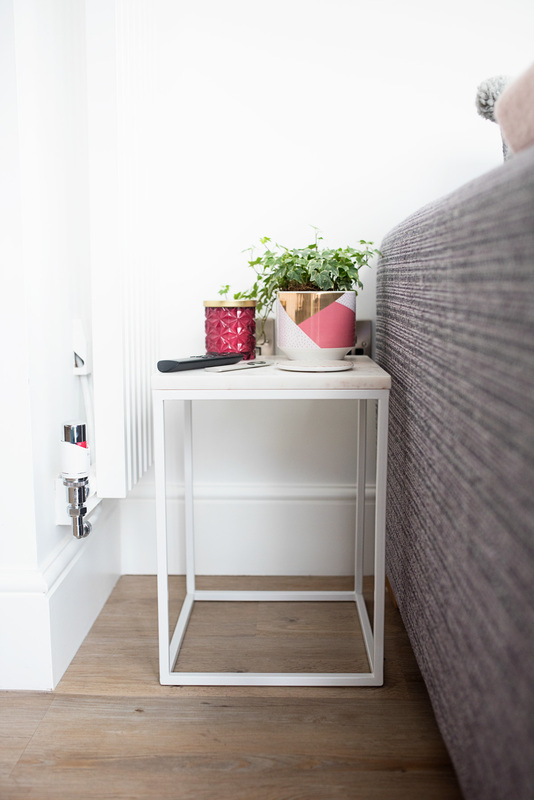 I was so pleased with the table, its quite a small space between the radiator and the sofa and I was worried that it would look cluttered, but at the same time it is nice to have somewhere to put trinkets on. I found this amazing white marble effect table from George at Asda for £25 which is such a bargain as it is actually a really nice quality. (It is sold out at the moment but seems to keep coming back into stock so I included the link anyway). I put little trinkets on the top. 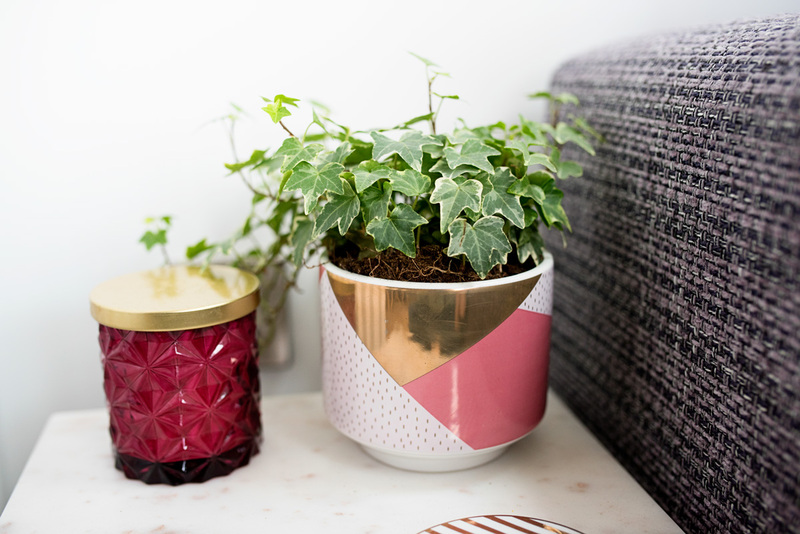 The planter is from Maisons du Monde (sold out), the candle is from Homesense (not online) and the little coaster is from Sainsbury’s. The light is actually another one of Jon’s ideas, I was originally looking at brass ones and he spotted this pink one on Habitat. 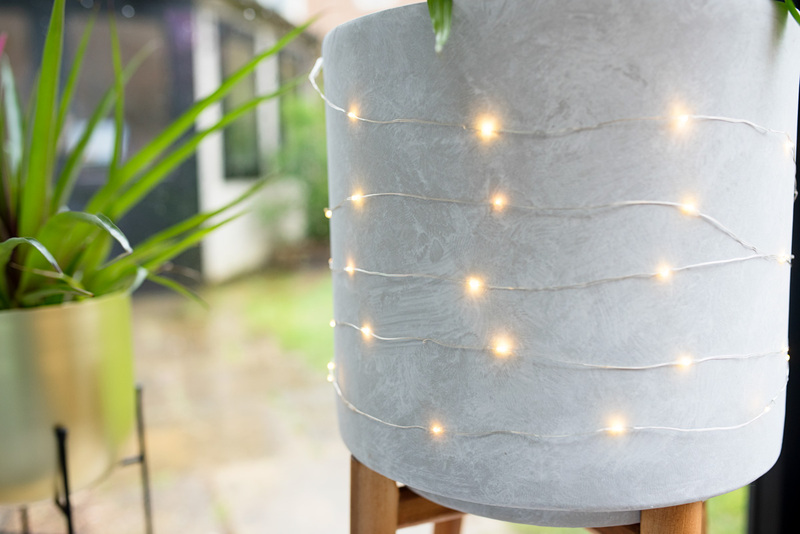 It was a little more than we wanted to spend on a light but we couldn’t believe how perfectly it went with the room, it’s gorgeous, and definitely makes the room more cosy at nighttime. We also keep a couple of boxes of Wren’s toys down here (the boxes are from IKEA). 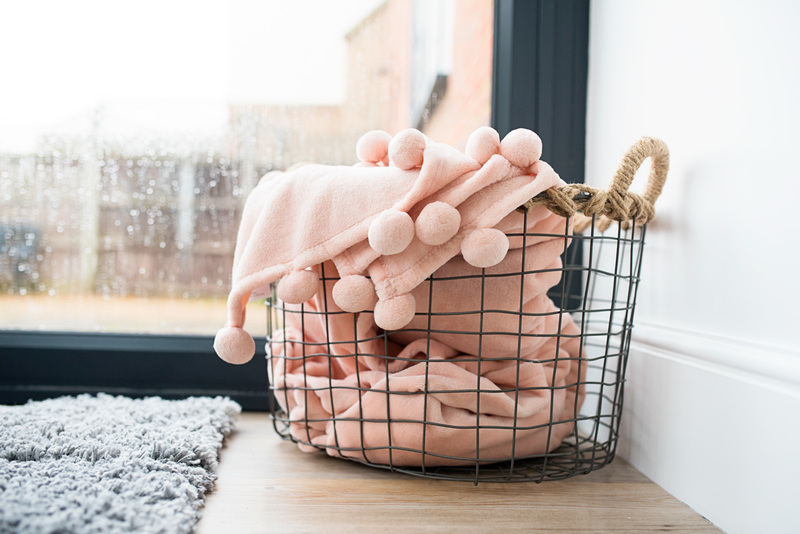 I really loved this basket from Homesense and as soon as I saw it I knew it would be a perfect spot to keep our throws and blankets in. 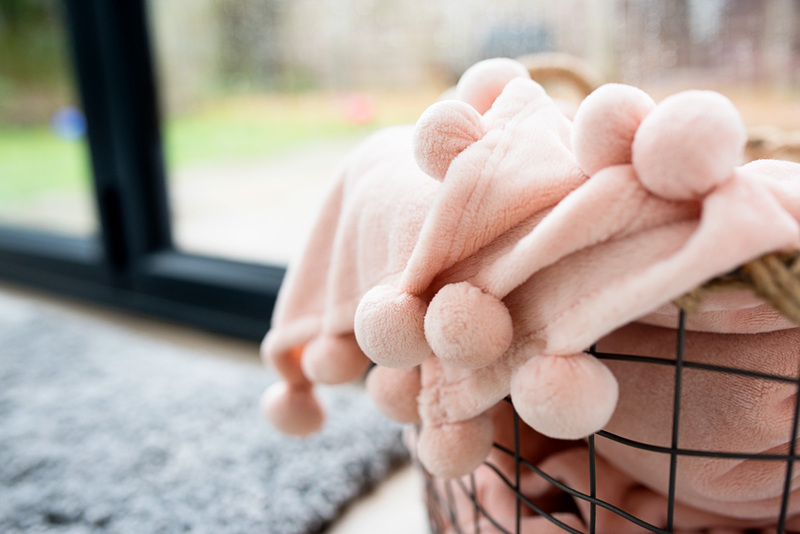 The throw itself is a recent purchase from Wayfair. 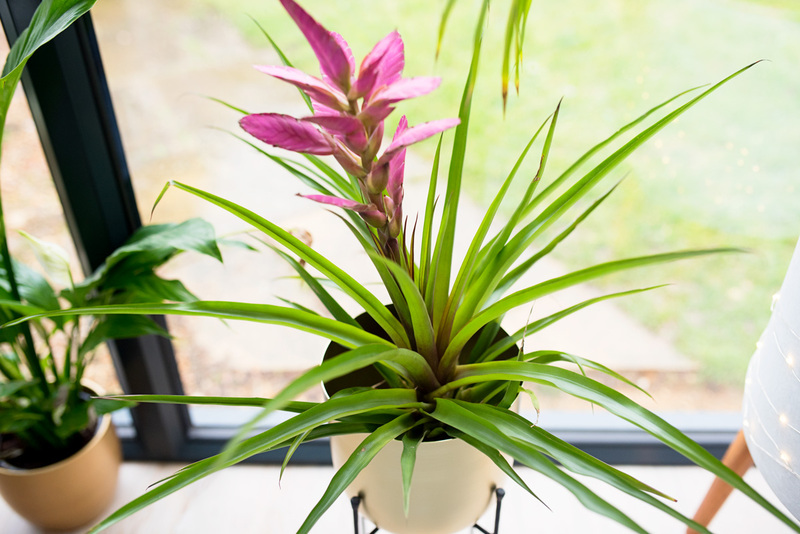 I’ve always been a bit of a cacti and plant fan, but since living in this house and having more space I have become a little bit of a crazy plant lady. 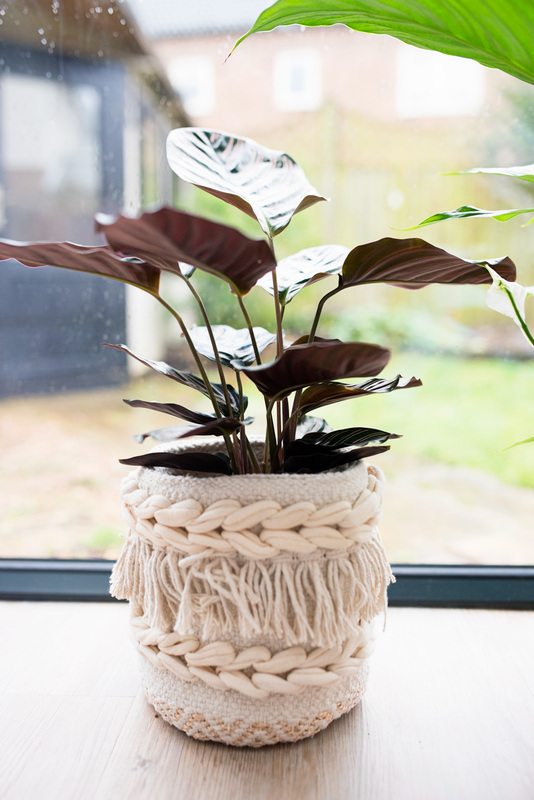 I love styling and finishing off our rooms with lots of greenery, I don’t know why as I couldn’t be less green fingered when it comes to our garden, but I just love house plants so much. 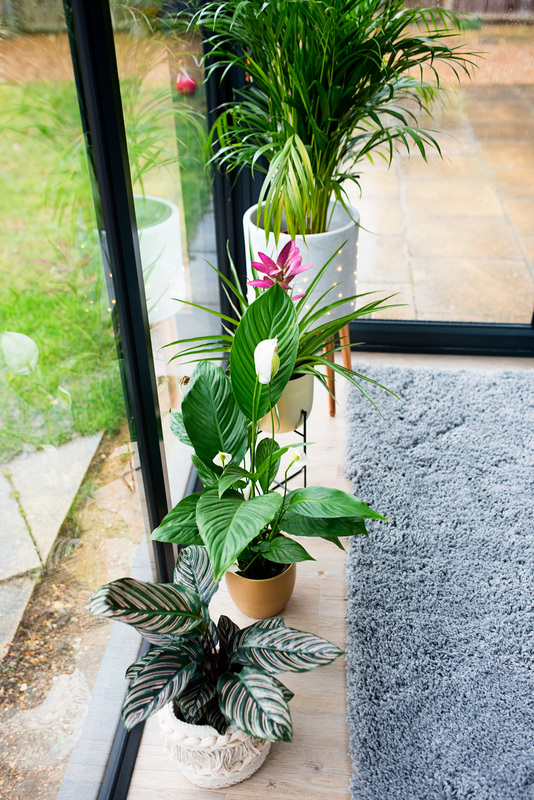 As our conservatory is essentially a garden room, I wanted to make plants a big part of it so I got a fair few. 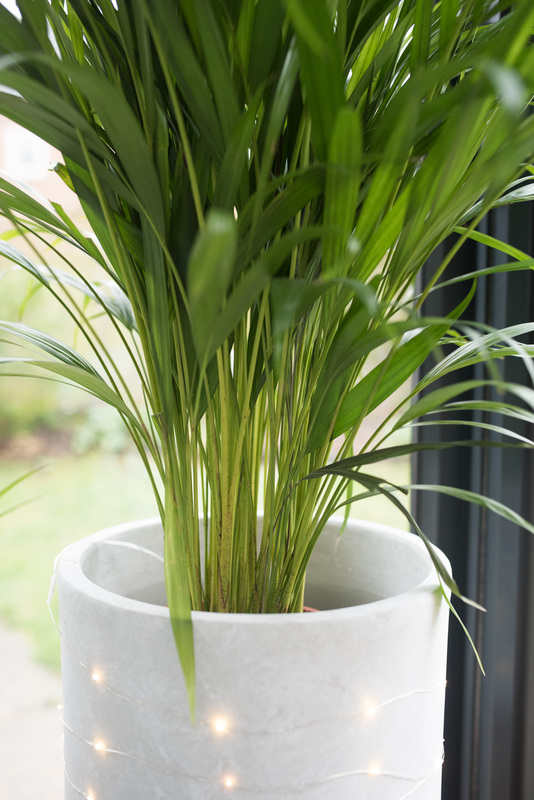 I mainly pick up my plants from IKEA or the garden centre. 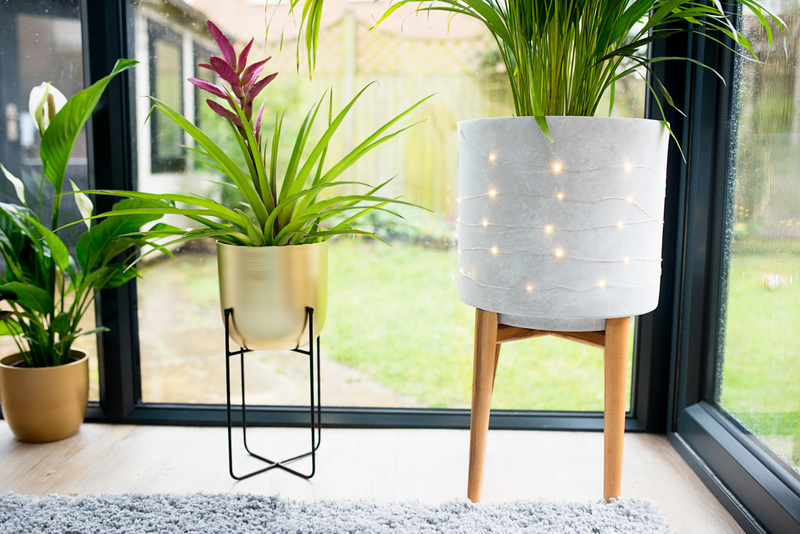 In terms of the pots the large cement planter is from Next (I have put 99p fairy lights around it to jazz it up a bit, the gold planter with stand next to it was a bargain £12 from Matalan, the gold pot is from our local garden centre, and the basket is from TK Maxx (not online). We definitely needed to have a tv in here if we were going to utilise and use the space properly, but we didn’t want to obscure all the lovely glass. We decided on getting a small one and mounting it to the wall. It’s the perfect size and means we properly use it as a family room 95% of the time. The only thing is sometimes it can be slightly hard to see at 4pm on a winter’s afternoon with the bright glowing winter sun. 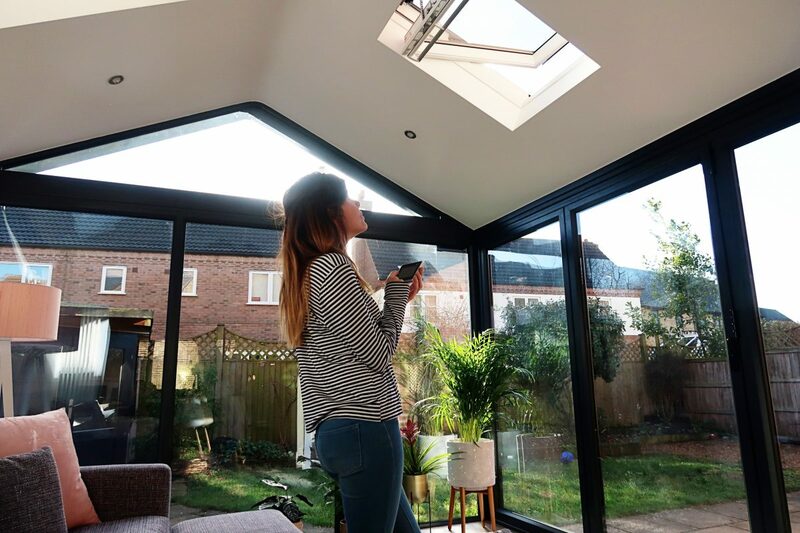 We had VELUX windows in our last extension because we find them not only an amazing design feature, but also a really great way of letting in a lot of light and air, so there was no doubt we were going to get them again in this new home. We actually upgraded this time to VELUX INTEGRA solar powered windows instead. The ceilings are really high in this house, which is a lovely feature, and so we wanted to do the space justice. 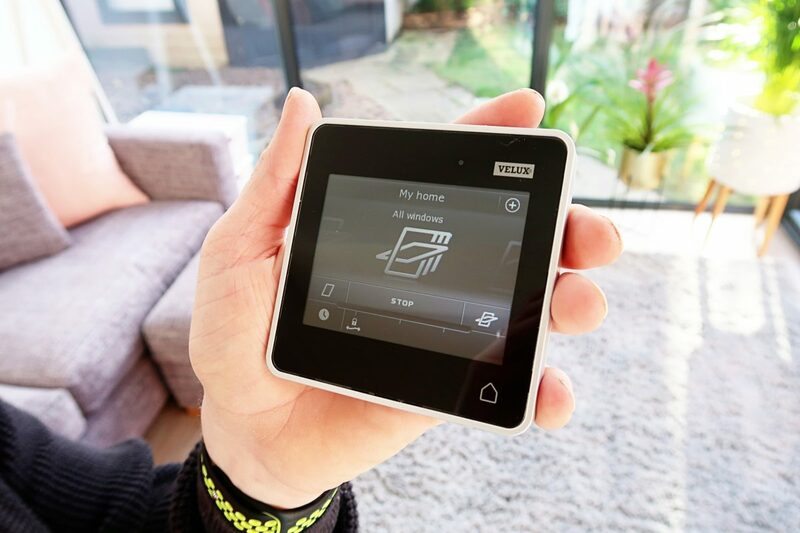 The VELUX INTEGRA windows mean that you can control different settings via the control panel and they even have a rain sensor feature too. They let in so much light and there is nothing better than opening them and having some lovely air flowing through the house. Here’s a view of our conservatory from looking at it where those old existing doors where. I still can’t quite believe it is ours, I love it so much. Overall we are thrilled with our new space, it was a bit of a gamble doing it so soon after moving, as a few people told us we should live in the house first to get a feel for what we wanted. But it’s perfect, the perfect space for a family room and the perfect room for our family as we grow. I am loving making this rather tired, slightly shabby in parts house into our happy forever home. It looks absolutely stunning Katie and such a big difference compared to when you first moved in. Hi Katie, I am so happy I found this video. This is exactly what I am planning to do with my current conservatory. I really love the outcome of yours and wonder if you could give me the contact of who built yours. It’s because it is a really local company to us and I am happy to let people know if they are local to us and message me but I don’t really want to give it out on here and have people find out where we live. It looks amazing, your house is so stylish. These house posts definitely inspire me to work hard so I can have a nice house in a few years! It looks incredible Katie, what a difference it makes! You guys muse be so very happy with how it’s all turned out. It looks like such a great space and I really love the glazing, especially the triangle of glass at the top (not sure of the technical term?! 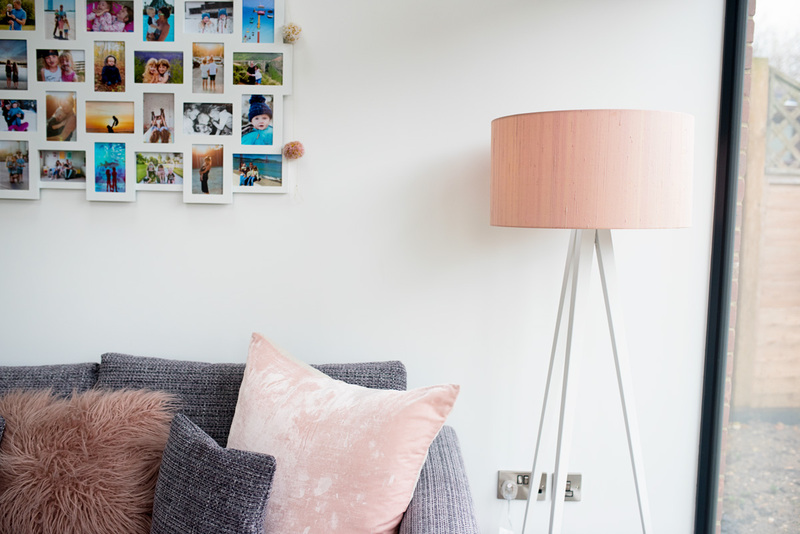 haha) Love the colour scheme – our bedroom is all greys and blush pinks and I love it, such calming colours. We considered getting the electric veluxes when we did our ground floor extension. It was one of those costs we dismissed as unnecessary, and it’s one thing I REALLY WISH we had gone for now we’ve lived with it for a year or so. I just never bother to open them with the pole. Wow! I absolutely love what you have done. Seen lots of the pics on your IG feed but I love this blog post…thanks for sharing! 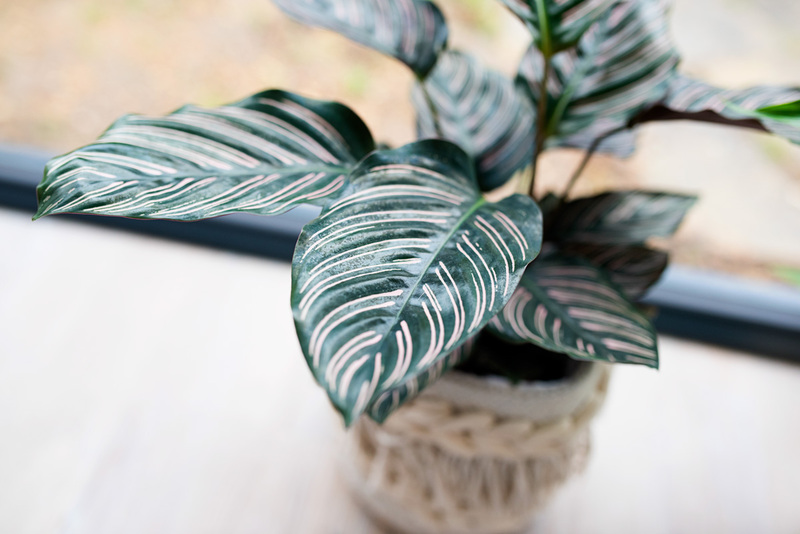 Plants are high on my hubs’ agenda for our home makeover…you have just reminded me about IKEA and all the great plants there! Such a beautiful space! 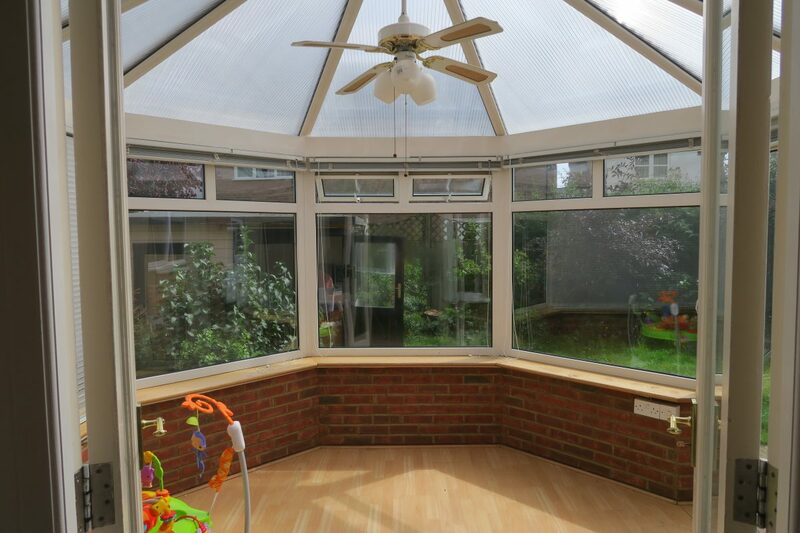 We also have an old conservatory that needs a serious upgrade. Any chance you can assist with a rough costing? Either way it looks fab! It all looks lovely Katie and flows so well. Can I ask where your living and dining room pendants were from please? Really enjoyed the new conservatory build video. 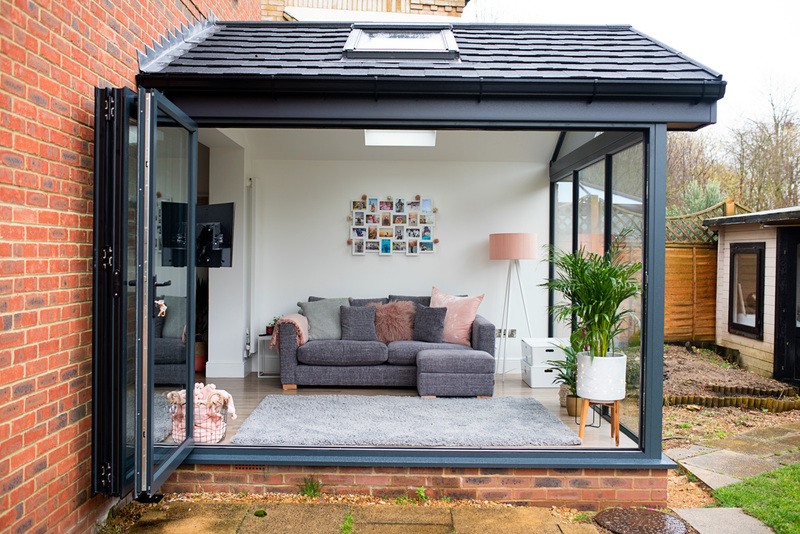 I have been debating for ages what to do with my conservatory ( very similar to your old one), would you be able to give me the name of your builder, a rough understanding of final cost and measurement of the new build please, as I need to present the idea to my husband!! Hi Katie, really enjoyed your video of your new build conservatory. I have the exact same old one and was wondering how to change it to bring it right up to date. The back of your house layout is very similar to mine so when I saw your video I thought that’s it !!! Would you be able to give me around about figure for the build and perhaps measurements. Great job Katie. Couple of questions, did you need planning permission? Did the builders put in new foundations? Do you have steel work? And do you have an idea of your costs excluding furnishing? Thanks. Please could you tell me if it is old in winter? No it’s the same temperature as the rest of the house. 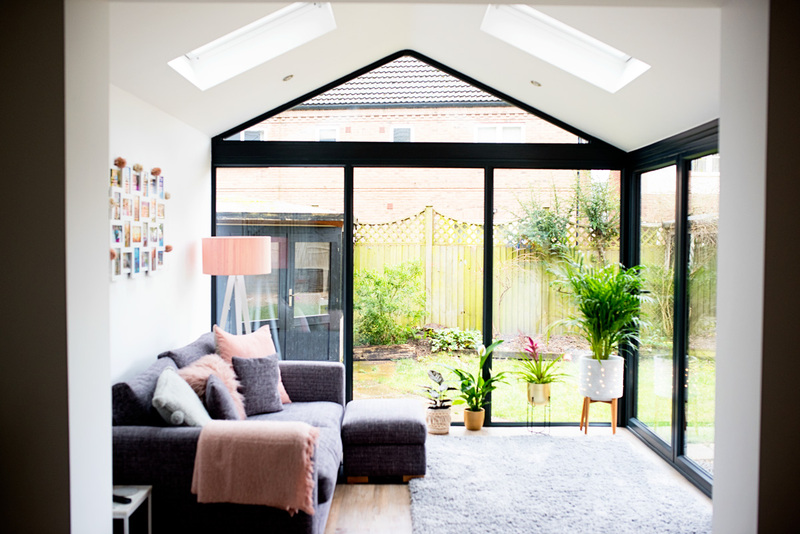 Really inspired by your video on your conservatory extension. We have exactly the same situation. Would it be possible to get some idea of costs and where you got your framework and doors from? Wow what a difference a makeover can do. Your space looks perfect and I bet that now you use it far more than before! Hi there, looks great. did you go for aluminium or upvc windows? Looks great Katie. I watched your YouTube video and it’s so amazing. The after look is so elegant. I have the same situation before and I luckily found the right company (All Seasons Roof) to work on the conservatory. Hi Katie, Your extension looks fab! Which company did you use for the roof? Is it a lightweight warm roof such as Guardian? I am having a quote this week for similar. It’s beautiful!! 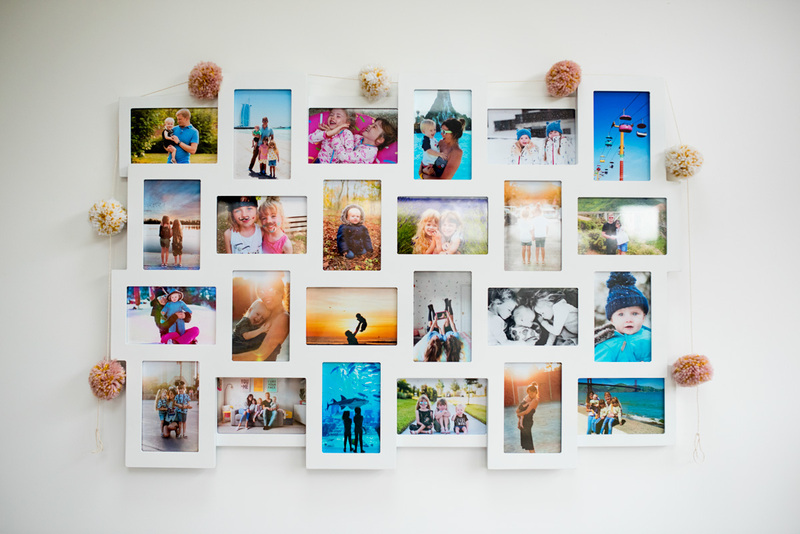 I’m thinking of doing something similar in our home but I have a few questions as I’m getting confused!! 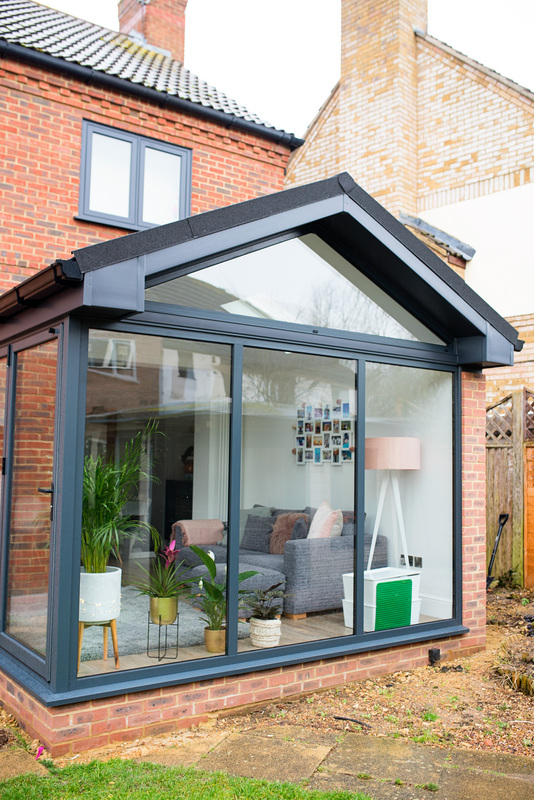 Does this class as a conservatory or an extension? As in did you need planning permission for it being an extension as I know you don’t need one for a conservatory. 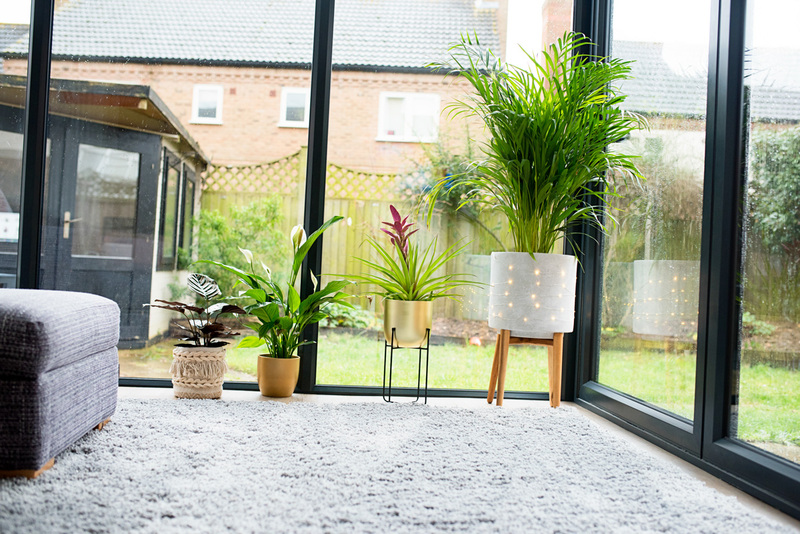 If it’s a conservatory how did you get around removing the thermal barrier between the original house and conservatory and how does this affect the house to resell etc? Would you have to re put a door in between? Sorry for all the questions but I don’t know anyone that I can ask who has done something so similar to what I’m after! Love it! It’s classed as a conservatory. It is the biggest we could have without needing planning permission. 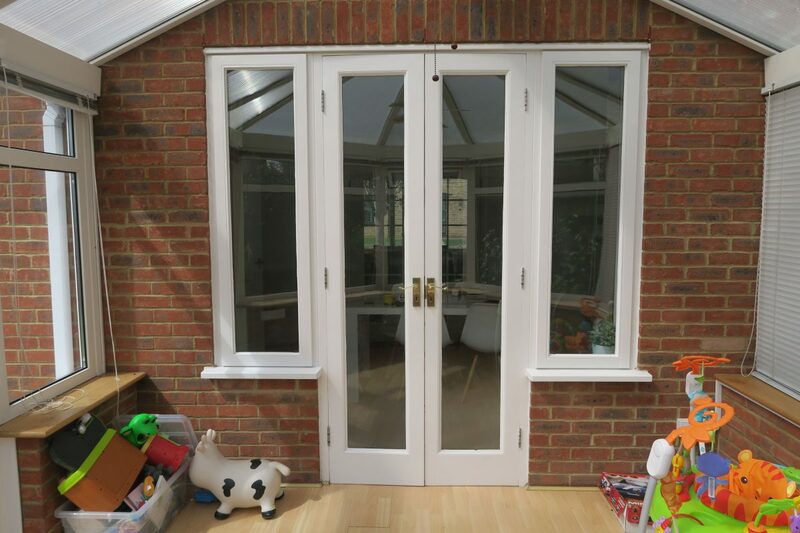 In terms of the thermal barrier there was already a conservatory there with internal doors so we don’t need to worry for resell. However just to help clarify for you a little bit we did the same in our last house and we took out external double doors there. We were advised by our builder to keep hold of the external doors (even though there was just a big open plan arch instead) just because it would make it easier when it came to selling it. It’s not as if anyone would ever put them back on but for legality reasons. We were also told that it might flag up on the survey. However none of this happened, it didn’t get flagged on the survey and the house sold with no problems at all. It wasn’t even a slight issue. So many people are doing it nowadays. Hope that helps. Looks fab! Garden next? 😉 I found your blog via the #bibs shortlist – good luck! No we didn’t it fell just under the right size. Of course not, it cost us just under £20k not including flooring or furniture. Sorry to ask but can you give me size and an idea of the cost? Can you confirm that you have now have no problems with heat or light ? Well done you. Dicyou employ a builder or,a conservatory’ company. Thanks ever so. Really like the renovation we have something similar to modernise. What are the dimensions of your room? It looks so spacious.